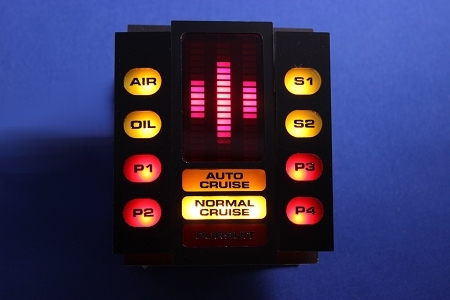 Knight Rider KITT voicebox display for a season 2 dash (2-TV), with a clear red lens and a red pursuit light. One of our most popular items. 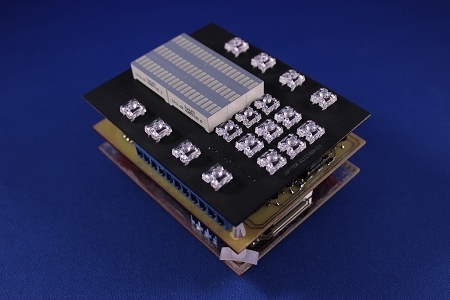 Reference design for hundreds of conversions. Cover included, with laser engraved colored inserts. Built-in 4-step sequencer and tone generator. Countdown assembly not included, available separately. 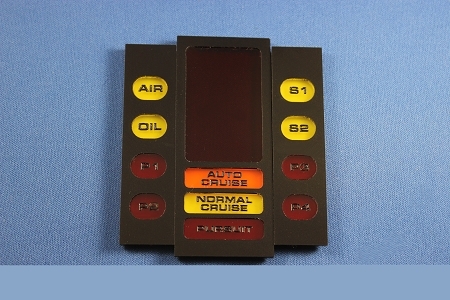 Operates from any 12VDC supply and an audio signal. Compatible with any car make and model. Can also be used at home with your PC when used with an AC adapter (not included). Please note: although this is called a voicebox, this unit does not actually speak by itself. It reacts to audio signals, such as music or voice.